A New Forest bog ate my son - a sensational headline! A New Forest bog tale! My New Forest bog tale is funny (well I wasn't the one who fell in the bog was I?) 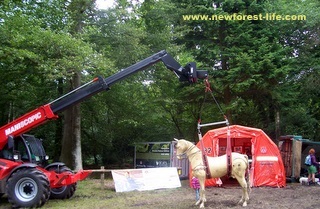 but also a warning to all walkers and riders who visit the New Forest and yes, a New Forest mire ate my son! Well, that would be the tabloid headline I'm sure. What actually happened was that last weekend we went out for an uneventful family walk. The New Forest bog story begins. We admired the beautiful ponies, walked over lovely landscapes and puddled through beautiful little brooks. I was able to point out the carnivorous plants that grow in the boggy areas of the New Forest, next to the many streams that flow through the valleys. We were following the path of a small, shallow brook and had already avoided any slightly boggy bits by simply jumping across them. I was just 4 feet behind my son, chatting to his friend Micheal who was staying with us for a wonderful weekend experience in this beautiful setting. We could see we were coming up to a stretch of forest floor which was a bit boggy, but as it was only about 3 feet to jump across, we didn't have any worries about crossing it. The next thing Micheal and I knew, my son had disappeared from in front of our eyes. In fact there was only this squirming creature of about 3 feet from waist to head left in front of us. The whole of his feet, legs and lower torso was lost in the brown, forest goo. Afterwards, our reaction worried me most. Micheal and I fell about laughing!! We couldn't take in what had happened - one minute he was standing in front of us and the next minute half his body length was lost in a bog! Luckily, without any help from his hysterical mother and friend he managed to drag himself out - and managed to save his lovely watch! then landed like a putrid, brown, beached whale in front of us. We took another way across the mire!! When we saw he was safe we continued to fall about laughing.... then the smell got to us. 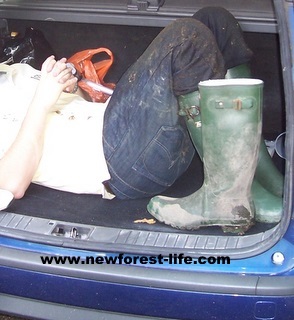 We staggered back to the car, still bursting into fits of uncontrolled laughter at the sight and smell of him and then had to load him in the boot - even the dog ignored him - he really was too smelly. 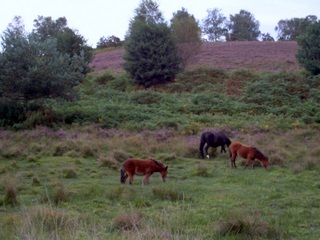 If you want to find out more about New Forest Heathland, bogs and mires there's lots more information here. Welcome to SiteSearch. I really hope you find this Google tool helpful in finding your way around my site. Are you wondering where you saw the Sandy Balls Holiday Centre? Perhaps you found some information, or a really lovely photo of a pony, and wanted to find it again? In the search box below, simply enter Sandy Balls and hit the Search button. 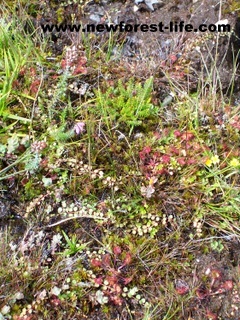 If you haven't been put off by this New Forest bog tale would you like to view the area on WikiMapia?